Laboratories are one of the most energy intensive spaces of any buildings. Since safety is of primary importance, engineers historically have overdesigned the mechanical systems servicing labs with the mistaken perception that "more air is better" or worse yet, "dilution is the solution". 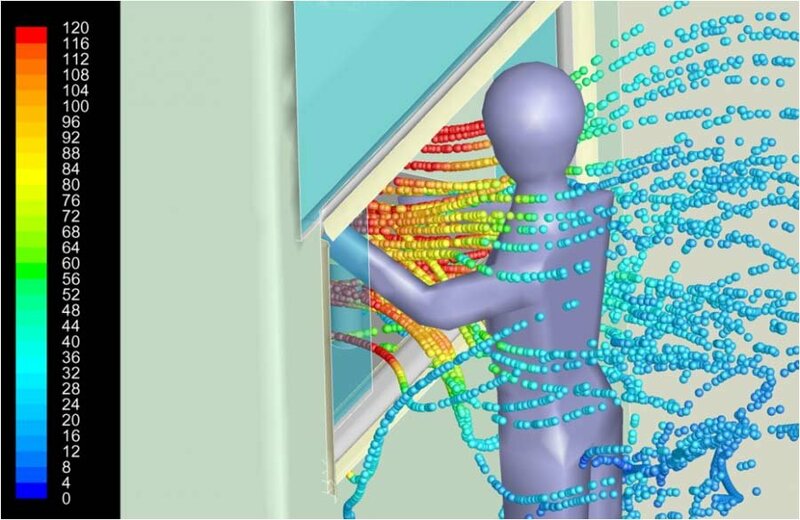 Computational Fluid Dynamics (CFD) provides a systematic methodology to accurately assess both the ventilation performance of laboratories and the containment/energy efficiency of fume hoods that may reside in those labs. M/E Engineering has used CFD to evaluate many laboratories ranging from the academic arena to large corporate clients. We have also benchmarked many of the CFD analyses against the ASHRAE Standard 110 test, smoke visualization, and anemometer measurements. The results from the studies are generally used as feedback to the lab designers to dramatically improve safety while simultaneously lowering the operating energy costs. It is not unusual to realize a 30% decrease in energy while achieving a robust 100% containment in the lab's fume hoods. CFD evaluation of the containment ability of fume hoods. Studies that simulate the ASHRAE standard 110 test for fume hood performance. Assessment of chemical contamination in labs. Determination of purge time after a chemical spill. Determination of the ventilation effectiveness using a virtual, hybrid ASHRAE standard 129. Optimization studies of lab safety and energy efficiency. Shown from a plan view, a person walks by one fully open and improperly loaded fume hood in a lab. Usually, this type of hood performs well over a wide range of operating conditions, but the combination of poor loading, a wide open sash and the currents from a moving person cause a momentary spill. The person is walking at 4 fps and the cloud surface has a concentration of 0.1 ppm SF6. Shown from an isometric view, a person fully opens the sash of a hood in less than one second. Because this is a variable air volume system, the controls, fan and air momentum take at least 3 seconds to adjust for the new sash opening. The sudden loss of air speed through the open sash causes a momentary spill that will disappear as the system compensates. In the mean time, contaminants will disperse into the breathing zone of the lab worker. Total length of animation is 2.8 seconds.